If you’ve been to a Greek Island you know that it can have an almost paradise-like quality to it during summer, but on the other hand the popular islands can be incredibly crowded as well, and most of them more or less close down for at least 7 months each year. One exception to this is Aegina Island, which is just south of the main Athens port of Piraeus, and it’s accessible all year round, though rarely overly crowded. Perhaps the best feature of Aegina is that it has a small fishing village atmosphere while it’s only a 45-minute ferry ride from the Piraeus port. You could have breakfast at a simple cafe in the center of Aegina town, and then literally be in the center of Athens itself less than 90 minutes later, thanks to the cheap metro that directly connects Piraeus with Syntagma Square. 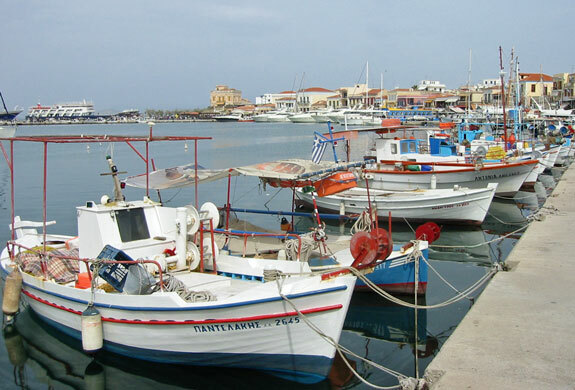 The key difference between Aegina and most of holiday islands in Greece is that it’s a bedroom community for many of the workers at the busy Piraeus port, so in Aegina Town most shops and restaurants are open all year round. At the end of the day many port workers head into Athens or its suburbs, but many others hop on the last ferry of the day to head home to the simple island only 45-minutes away. Aegina Town really feels like a historic fishing village, with boats coming in much of the day to offload their catch, and a main street lined with restaurants and bars. During the week it tends to be quite mellow, but on the weekends and during the peak of summer the nightlife kicks into high gear, so there’s no shortage of crowded discos or trendy bars. If you prefer something a bit mellow you can find it only a block or two inland, on one of the streets lined with shops of all kinds plus quiet restaurants. On the western side of Aegina Island you have the Aegina Marina, which actually operates much like many of the remote islands in that many of the hotels are completely closed down from November through April, but during summer it really fills up with tourists and Athens residents who’ve come to party and escape the crowded city. During the off season there are so few businesses open that it’s barely worth a visit, so it’s really more of a summer resort, unlike Aegina Town on the eastern side of the island. There are also small villages spread around the rim of the island, most of which are operating all year round, so by renting a motorbike you can reach any of them in under an hour for an even more traditional experience. Aegina calls itself the Pistachio Capital of the World, so the scenery is largely made up of pistachio tree orchards, which can be gorgeous when they are blossoming in spring. Unfortunately, you couldn’t really call Aegina a cheap place to stay, although it does offer good value compared to many other islands in Europe. Hotels and holiday apartments can be reasonably priced outside of the main summer season, but during the warm months you should be prepared to pay €100 a night and up. Those looking to slow their life down for a while can get good deals on short-term apartments during the off season. A modern and comfortable apartment can go for as little as €200 per week between November and April, as long as you are willing to stay outside of the main town. For meals and drinks and so forth you’ll be paying typical European prices, with a lunch at a local restaurant starting around €6 and going up to €15 for the better sea food dishes. A pint of beer at a bar or restaurant will be €3.50 to €5 depending on where you go, though wine can be cheaper and good if you go for the local stuff.